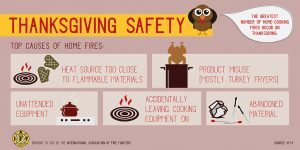 OSWEGO, NY – According to the National Fire Protection Association, cooking is the leading cause of home fires on Thanksgiving Day. 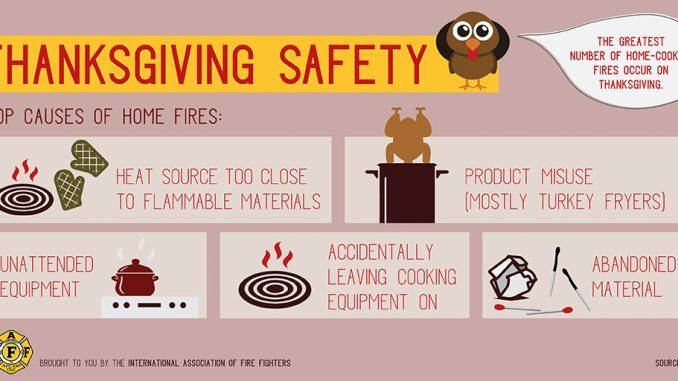 A cooking fire is three times more likely on Thanksgiving than on any other day of the year. The use of turkey fryers, which use a large amount of cooking oil at high temperatures also poses a significant danger and can lead to devastating burns, and large fires. The Oswego Fire Department reminds residents to only use these fryers outside and away from combustible materials. If you have an oven fire, turn the appliance off if possible and safe, leave the door closed, evacuate the house and call 911. For stovetop fires, slide a lid over the pan if possible and safe, turn off the burner, evacuate the house and call 911. Never attempt to carry a flaming pan! Thanksgiving is also a high time for cooking related burns. To prevent scalds and burns, cook on back burners and make sure all pot handles are turned inward. Appliances that get hot, such as toaster ovens, should also be well out of a child’s reach. Have a “kid-free zone” of at least three feet around the stove and areas where hot food or drinks are prepared or carried. The Oswego Fire Department urges you to cook with caution and wishes you a Happy Thanksgiving holiday weekend! For more information on how to stay safe, please contact the Oswego Fire Department headquarters at (315) 343-2161.